Hazrat Sultan Bahu Rahmatu-Allahe Ta-aala Alaihe says that 'the body and heart of the human being is the special Sanctum of Allah Almighty. One should peen into it and see Allah Almighty there. O Seeker! 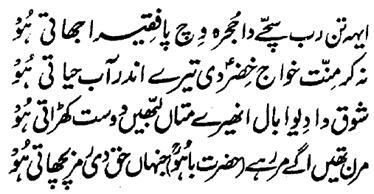 Do not beg Hazrat Khizar Alaihis-Salaam for obtaining Aab e Hayaat (Elixir of life). It exists inside yourself. O Seeker! Light the lamp of the Name-Allah-the-Essence (Ism-e-Allah-Zaat) in the world of your heart so that you may find your lost Friend there. At the end he says that 'those who have identified the enigma of Haq, they have died before death in accordance to: !